Definitely! I love my blush bag. Haha! No to black for spring and summer. I do carry my black bag a lot in winter, but I think gray is way more versatile as we head into spring. I already have most of these. I’ve never found the perfect pair of white jeans. I guess I need to try the premium brands. I’m going to try the cropped straight leg. I’m stuck on skinnies. I don’t find a trench suits my lifestyle anymore. I prefer a raincoat, style as there is lots of rain in my part of the country. Lots of good ideas! I like the Bradley Mischka Anorak at Nordstrom, especially in the coral color. FYI, the Old Navy Marled V Neck Sweater that you have in pink is on sale “today only” for $16! It comes in pink or blue, and regular, tall and petite. Have you tried NYDJ. They have several styles of cropped jeans and they are always very comfortable. They are made well and Are my favorite for jeans and pants. I have. They aren’t my favorites but I know a lot of women like them. My part of the country is hot most of the year. I’m still in sweaters just because I can! I do use the denim jackets at work where it is cold. I haven’t found good white jeans. I keep looking, but bootcut or straight is my jam and under $60 is my name….maybe if Wit & Wisdom had some? You can find white jeans in bootcut at Chadwicks.com for $40! FYI – they tend to be a ‘curvy’ fit with slightly smaller waist and slightly bigger hips! I’m so pleased with myself that I already have several of those things in my wardrobe. I’m learning! As always, your posts are informative and inspiring. I’m wearing that navy dotted J.Crew dress today! I love it! I’m wearing a navy cardigan over it and navy tights to keep me warm! Great post JoLynne, chock full of ideas. Check out Social Threads for Blank NYC crop kick flare jeans. They look cute and are a midprice Jean @ $88. When I get back from vacation I was going to order in the white and see how they wear. I am starting to like the look of this style. they seem to look best if fitted through thigh and end just above the ankle. I am still trying to figure how to wear boyfriend jeans without looking like I came off a farm ! Ha! I just got their email today and was looking at those. FABULOUS post! Several of us have been waiting to hear your thoughts onspring handbags. Now, instead of buying a floral or bright handbag, I will buy a neutral that will go with more pieces in my closet. I want to challenge myself to not purchase spring clothes until I change out of clothes and know what I REALLY need. I hope the winds up there settle down! Be blessed! Oh, I think a bright bag can be fun too! 🙂 But if you only carry one all the time, I would go with a neutral. Oh happy day! I have several neutral handbags, so I will probably go with a bright color. DSW has one that is fuchsia and bright red that caught my eye. Great line up of essentials! I was in Nordstrom’s over the weekend and finally broke down and purchased the Tory Burch Miller sandal in Makeup color. I’ve been eyeing these for a over a year now and decided this to finally add them to my Spring/Summer staple! They are pricey but I’m hoping my cost per wear will reconcile out my budget! Now I”m eyeing the Dusty Pearl Trench coat from Loft. I already have a perfectly good trench but I’m loving this gorgeous color. Not sure I can justify two trench coats though. 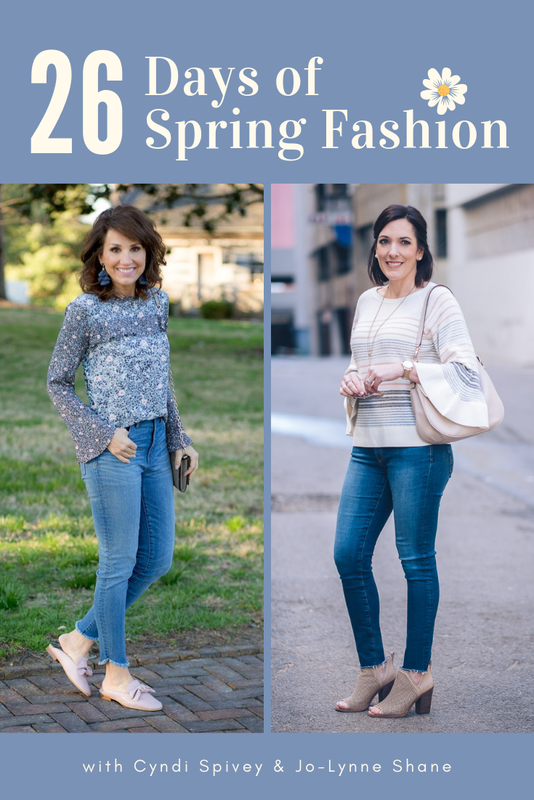 I can’t wait for yours and Cyndi’s Spring Fashion Series! All great pieces to have on hand as we enter spring. I’ve been thinking about adding another neutral handbag, but I’ve yet to decide what style/brand. I’m leaning more toward Rebecca Minkoff since my style has gotten more and more casual recently, and I love the more casual vibe of a lot of the RM styles. Yes, I was looking at her bags yesterday to see if anything resonates. I love her classic/edgy style. For a white t-shirt, what style of neck works well for a very small-chested, tall/slender body type? Hey Karen. A v-neck is universally flattering, but you can also get away with a crewneck or a boatneck, which those of us who are bigger on top have a hard time carrying off well. Thanks for these! I have a question about fashion sneakers. I have a super casual lifestyle and have a pair of gray Adidas Gazelle sneakers, and white Converse Shorelines. I know these are both styles that have been around a few years, but I hesitate to add another pair of sneakers to my collection (I’m a bit of a minimalist). Do you think these are still enough in style to wear or should I splurge for new white leather sneaks? Thanks, need a girlfriend’s advice! Could you tell me about the tote that is pictured in the photo behind the title to today’s article? In the picture with the trench coat. I have been looking for one like that for ages but don’t see a link to it in the article. I’m sorry, that picture is from the Nordstrom website, and it was last spring, so I can’t find it to see if the bag is available.